While flight delays generally come with distress and disappointment, passengers of Spirit Airlines had a great time. A Spirit Airlines flight at the Myrtle Beach International Airport in South Carolina was delayed due to some bad weather conditions, however, unlike typical flight delay announcements, passengers did not sigh. Infact, the delay resulted in an impromptu dance gig by the passengers joined by the airline staff. 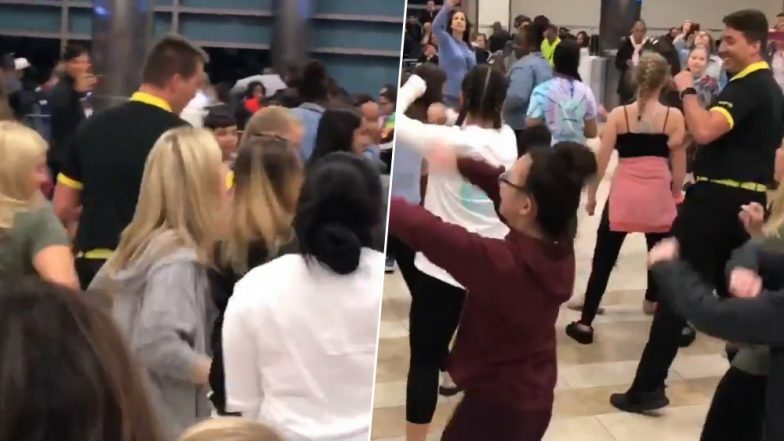 A group of girls who were cheerleading at a competition last weekend were also scheduled to board the flight going to Atlantic City. The cheer girls also joined the dance making the whole airport watch. And now the video of the scene has gone viral on social media. Chinese School Principal Dances With His Students and Motivates Them to Exercise; Watch Video. Kristie Brown, one of the cheer girls shared the video on Twitter saying, "A @SpiritAirlines employee helping our cheerleaders pass sometime during our delay!" The airlines shared the video saying, "Our flights are mostly on time, but when they aren’t…we make the best of it! Huge shout out to Robert Dillon at @flyMYR who kept our Guests entertained while they patiently waited to board their flight! #WhenLifeGivesYouLemons @AC_Airport" Viral Videos of Pregnant Woman Dancing With Doctor Ahead of Her C-Section Delivery Inside OT and Other Such Episodes Will Make Your Day. Spirit Airlines in a statement told Yahoo, "At Spirit Airlines we strive for excellent guest experience, while providing the best value in the sky. In this case, our agent Robert Dillon, went above and beyond to help pass the time of a weather delay and have a little fun with our guests. We salute Robert for his positive attitude and his awesome dance moves. We'd also like to thank Kristie Brown for sharing this moment, and the South Jersey Storm dance squad for choosing Spirit."